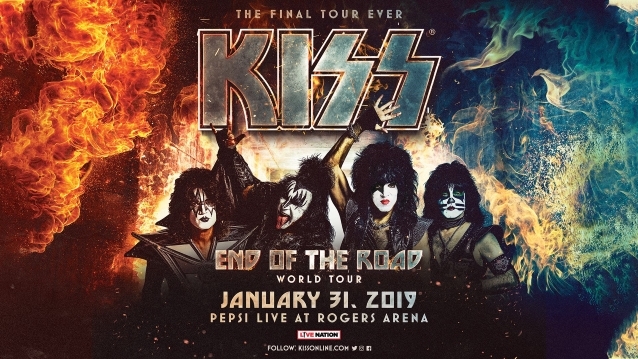 KISS kicked off its “End Of The Road” farewell tour Thursday night (January 31) at the Rogers Arena in Vancouver, British Columbia, Canada. The band played a 20-song set consisting of four tracks from KISS‘s self-titled debut album (1974), one from “Hotter Than Hell” (1974), one from “Dressed To Kill” (1975), five from “Destroyer” (1976), one from “Love Gun” (1976), one from “Dynasty” (1979), two from “Creatures Of The Night” (1982), one from “Lick It Up” (1983), one from “Animalize” (1984), one from “Hot In The Shade” (1989), one from “Psycho Circus” (1998) and one from “Sonic Boom” (2009). Check out photos from the Vancouver Sun. The first North American leg of “End Of The Road” will hit an additional 42 cities. The lineup features the current version of the band — Stanley, Thayer, Gene Simmons and Eric Singer. But Stanley has hinted that former members like Ace Frehley and Peter Criss could make appearances.